To keep your stone in tip-top shape, it is important to recognize what can harm your stone. 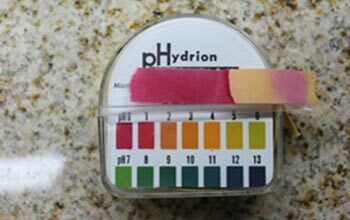 Low on the Ph scale: many liquids such as common bathroom cleaners, alcoholic drinks, carbonated beverages, fruit juice, fruit and vinegar. 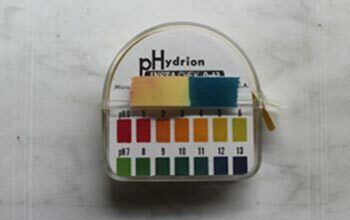 High on the Ph scale: these liquids are opposite acids. Many of your household cleaners are alkaline and may be too harsh for your stone. 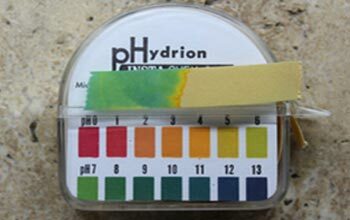 This is the right pH for your stones. Because is says good for marble too does not mean It’s the right cleaner. Rinse less cleaners are best for natural stone. Caused by foot traffic, abrasive grit, moving furniture, vacuum cleaner wheels, and sometimes your dog’s toenails. Caused by various foods, spilled drinks, water damage, pets and anything else imaginable. Elimination of these potential problems, and awareness of your stone’s vulnerability, will prolong the life of your stone giving you added enjoyment. All stone needs to be sealed with a penetrating sealer, which leaves no coating on the surface of the stone. While the stone is trying to reject liquids that can leave a stain, these sealers give you more time to wipe up a spill. Sealing is a must for all kitchen and bathroom areas. Premium impregnators that reject are worth the extra cost. Always require a small test of the proposed sealer on your stone. Approve a sample tile or piece of slab before the sealing is done. Some sealers can slightly change the color of your stone. Do not assume that your builder, installer, or stone fabricator sealed your stone. Household chemicals are not formulated to clean your stone. Many can do more harm than using nothing at all. Even the use of water alone can have long-term detrimental effects on some stone. Neutral cleaners, containing conditioning agents, or the use of stone soap, is recommended. Repeated use of an appropriate cleaner will keep your stone looking fresh, and add to the natural luster of the stone. Due to the softness of much of the stone used in your home, it is imperative that grit (sand, dirt) be kept off all surfaces. Grit is normally harder than stone used in residential building, and is the main cause of scratches, especially in floors. Entry floors require walk-off mats that will cover two adult steps. Remember to wash off the mat frequently to remove the accumulated dirt. Be aware that rubber backs can leave marks in your stone requiring costly restoration to remove. If your floors have a lot of traffic, dust mop daily with an untreated dust mop. Damp mop your floors weekly with a conditioning neutral cleaner or soap. Follow the directions. In most cases it is advisable not to put coatings on your natural stone floor. Coating restricts the flow of air through the stone, causing moisture-related problems. Vanities, counters, and walls can be cleaned, by placing an appropriate cleaning agent in a bottle. Spray the surface, and wipe clean with a soft natural fiber cloth. 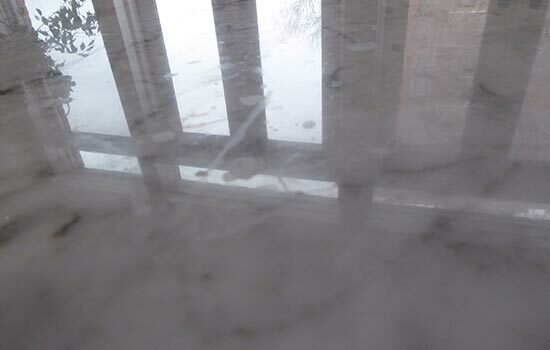 These surfaces can be polished with a topical stone paste. The application of this paste wax will add shine, and protection, to the stone. It is best to seal and wax stone showers. If mildew begins to grow on the stone in your shower, it can be difficult remove. 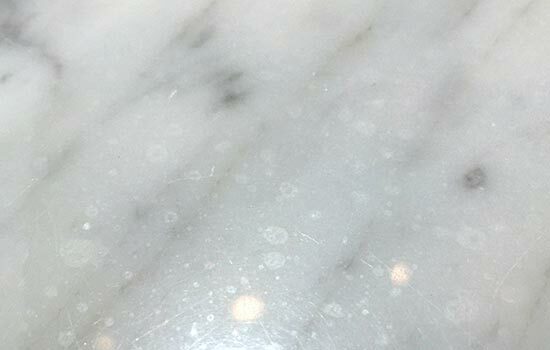 The chemicals used to remove scum and mildew will ruin a marble, requiring expensive restoration. Several granites are acid resistant, making them easier to clean. Waxing and using the correct maintenance cleaners, are much less expensive than having to pay a stone professional to restore your shower. When stone begins to lose the factory shine, it is best to call a professional to re-polish it. Using the proper abrasives and polishing powders can bring back the original shine, if the surface is not too badly damaged. Polishing generally does not remove scratches. However, on some stones it can remove light etch marks left by chemicals or cleaning agents. Resurfacing operations are required to remove scratches, uppage (uneven tiles), and wear patterns from foot traffic. The stone is sanded with various grinding grits. This makes the surface flat, establishing a new finish. A ground-in-place floor extends the life of the floor. This is not recommended for the do-it-yourselfer, a professional stone contractor is required. DON’T use products that say and good for marble too when ceramic or porcelain tiles are also recommended. DON’T use scouring pads that will scratch the surface of the stone. White polishing pads are best. DON’T sit or stand on your countertops. DO use protective mats under hot dishes or cookware. DO use hard mats outside and soft backed mats at entryways to trap dirt and sand from normal foot traffic. DO use dust mops before mopping floors and dust mop regulary. DO clean surfaces regularly with neutral cleaners designed for stone or a neutral cleaner with sealer in it. DO use non acid toilet bowel cleaners for all natural stone surfaces. DO use trays for all soap and soap dispensers in kitchen and bathrooms. No sealer will hold this out. DO use soft towels or Micro Fibor towels. If all of the marble and tile in your home has been sealed, the sealer can last for years with the proper care. Please check the warrantee on each sealing application. Using a marble cleaner will help the sealer hold out staining, not etching. The marble cleaner should have a PH of 7, which is neutral. When spills occur, wipe them up quickly. Do not allow them to sit for an extended period of time. Most foods, fruits, vegetables, soft drinks, and juices can eat through the sealer and cause staining to occur. There are some sealers that are not affected by acids. They area much more expensive to the customer. There is no sealer on the market that is 100% stain proof so even the best sealer can stain after an extended period of time. The proper cleaner to use is one with a sealer in it. A regular marble and granite stone cleaner will help keep the countertop protected and keep its beauty for years. Some cleaners now have 1-3% sealer in them. Be careful of stone soaps. These are good for a limestone floor, but not countertops. Too much soap can build up after time. Never buy a product that says “and good for marble too”! Dish soap can cause the counter top to loose its luster. Soap build up over time will become sticky and attract dirt and become streaky when trying to clean it. Soap dispensers drip and can slowly eat through the sealer and stain the counter top. The trend now is to use a foam soap which will not drip and cause unsightly stains and also takes less water to rinse. Most store bought spray polishes tend to be oily and cause a build up over time. Even some that say Stone, Marble or Granite polish on the label. A spray polish is most likely the best choice. Liquid polishes tend to be very oily and look great for a while and then build up over time. Some polishes now have silica in them and adds a micro thin coating to keep the Marble and Granite easier to maintain that beautiful look. The biggest problem with floors is the way it is cleaned. Most TV commercials show a flat mop. This looks great but these applicators clean the top of the tile and then drop the dirt into the grout. Using too much soap can make the floor harder to keep clean. Sealed floors need a marble neutral cleaner. This is a mix with 2 to 5 oz of product to 1 gallon of water. Warm water is better than cold when cleaning ground in dirt or grease. AVOID: Store bought cleaning chemicals! Most of these cleaners are a base (alkaline) or an acid. Both will strip the sealer and cause the tile and grout to be harder to keep clean. Harsh cleaning chemicals can and will discolor the grout and make it hard to keep that beautiful even look. Most bathroom cleaner will etch the polish of the marble and limestone finishes. What adds insult to injury is the harsh chemical cleaning products that promise to return stainless steel appliances to their showroom origins. With the hefty price tags of these cleaners, and their pestilential nature, why own anything stainless steel? Do we really want those adorable little toddler mouths and fingertips in contact with the cosmetically fragile contraptions, coated with chemical cleaners? Here is a ‘how to’ on how to clean stainless steel appliances without harmful chemicals for a flawless finish! Find the grain of the metals and clean with a neutral cleaner or degreaser and a soft rag, micro fiber, or soft paper towel. Clean with the grain and then buff out. Oil polishes are ok but tend over time to make a streaky mess which is hard to clean up. These products are good but need to be deep cleaned and removed once in a while. Remember Oil’s attract dirt like a magnet. Note: Several ice-melting devices are available, which do not contain harmful salts. Many problems can occur with stone surfaces. The above ten are the most common. The following is a quick problem-solving technique that will help identify other stone problems that might be encountered. Identify the problem – Is it discolored, etched, or cracked? Cause of the problem – What happened to cause the problem? Identifying the cause will often lead to the solution. Stone Type – Identify the stone type. Is it marble, granite, limestone, or slate? Check the installation – Is it installed properly? Age – How long has the problem existed? Old problems range from difficult to impossible to cure. Maintenance Procedures – How is the stone being maintained? Could the maintenance, or lack thereof, be the cause of the problem? Test the Solution – Perform a small test in an inconspicuous area to decide if your proposed cure will work effectively. Need Help With Your Stone?